In 2000, the Millennium Development Goals set out targets aimed at creating a safer, more prosperous, and more equitable world. If these goals were to be achieved, children’s lives would indeed be transformed. In this collection, achievements against these targets are identified, with each contributor examining the progress made in early years provision in Australia, China, England, Greece, the Netherlands, Portugal, South Africa, and Sweden. They highlight the priorities and agendas of their respective governments, and focus on the trends and issues which are particularly relevant to each situation, thereby revealing the social and educational inequalities that persist across countries. A common theme running through this volume concerns the political tensions that arise when governments and educators hold fundamentally different views about the nature and purpose of early years education and the needs of children and families. It is clear that although the past two decades have seen many changes in attitude towards the importance of the early years of life; politically, economically, and environmentally, much still remains to be done if the Millennium Development Goals for young children and their families are to be fully met. Despite this, this volume demonstrates that those who work in this area continue to experience a deep concern for the well-being of young children, which transcends cultures, frontiers, and political and sectarian divides. 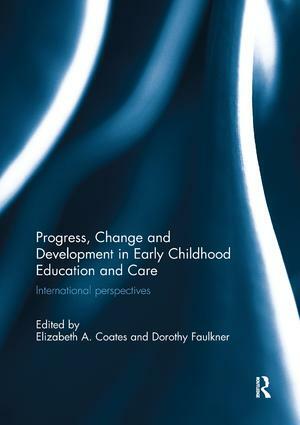 This book was originally published as a special issue of the International Journal of Early Years Education. Elizabeth Coates is sometime Associate Professor and Director of the Early Childhood Studies undergraduate programme at the University of Warwick, UK. Her present part-time teaching includes child development, education, and early years’ policy and practice. During her time at Warwick she organized and directed five triennial international early years conferences and was founding Editor of the International Journal of Early Years Education. Her background as an early years teacher has been a strong influence and, with Andrew Coates, she is involved in a longitudinal action research project which focuses on young children (3-7 years) talking and drawing together. This has resulted in a number of conference papers and publications including ‘The Subjects and Meanings of Young Children’s Drawings’ in Exploring Children’s Creative Narratives (edited by Faulkner and Coates, 2011), and ‘Recognising ‘The Sacred Spark of Wonder’ – Scribbling and Related Talk as Evidence of how Young Children’s Thinking May be Identified’ in The Routledge International Handbook of Young Children’s Thinking and Understanding (edited by Robson and Quinn, 2015). Dorothy Faulkner is a member of the Childhood and Youth Studies Research Group in the Centre for Education and Educational Technology at the Open University, UK. She is a developmental psychologist with research expertise in sociocognitive development during the early years, psychological approaches to the development of creative thinking and problem solving, and the psychology of education. In 2009, she chaired the production of the Open University Masters course, Understanding Children’s Learning and Development, and has contributed to a number of edited collections over the past 20 years including Cultural Worlds of Early Childhood, Learning Relationships in the Classroom and Making Sense of Social Development (1998), Rethinking Collaborative Learning, (2000) and Exploring Children’s Creative Narratives, (2011). Her recent research projects include the design and evaluation of computer and web-based environments to support social communication between children with poorly developed pragmatic skills (Murphy, Faulkner & Farley, 2013 & 2015), and an in-depth evaluation of the impact of a curriculum initiative designed to foster narrative development, literacy understanding, and communication skills in early years settings in the UK, (Cremin, Swann, Flewitt, Faulkner & Kucirkova, 2013; Faulkner 2014).